On first glance it may seem like there are a lot of steps to this recipe, but don't let that scare you off. Each one is so easy that even a kid can do them. In fact, stirring, mixing, kneading, and rolling the dough are incredible sensory experiences for kids. Handling the dough is also a great way for kids to engage their fine motor skills and show them how food can transform from one form to another. Set aside additional dough for your kids so they can manipulate it into knots, twists, balls, and other imaginatively inspired shapes. In a large bowl, mix together the water and honey. Sprinkle the yeast over the water mixture and let sit for 10 minutes. In a separate bowl, whisk together the flour and salt. Slowly add the flour and salt to the yeast mixture. By hand or using an electric mixer fitted with dough hook attachment, stir until combined and the dough forms a soft ball (adding more flour if the dough is too sticky), about 5 minutes. Rinse out the mixing bowl and then grease it with the oil. Place the dough in the greased bowl and turn it to coat with the oil. Cover the bowl with a kitchen towel and let the dough rest at room temperature for 20 minutes to 1 hour. Place the dough on a lightly floured surface and knead two or three times to remove air bubbles. Cut the dough into 16 equal pieces. Keep the dough covered with a kitchen towel when you’re not working with it. Roll each piece of dough into a 12-inch long rope. Make a U-shape with the dough rope. Pick up each end and cross one hand over the other and press loose ends onto bottom of U to make a pretzel shape. 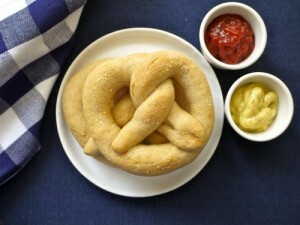 Place pretzels on a baking sheet lined with parchment paper, cover with a kitchen towel, and let rest for 10 minutes. Stir together the water and baking soda. Brush the pretzels with the baking soda and water mixture (if you don't have a brush, you can dip your finger in the liquid and rub it on). Sprinkle pretzels with salt and bake for 15 minutes, or until lightly brown.